The President-elect, Muhammadu Buhari on Thursday said the telephone call put across to him by President Goodluck Jonathan congratulating him even before the final result of the presidential election was announced had changed the course of the nation's political history. Buhari acknowledged that the incumbent president was capable of using the power of incumbency to make things difficult on the outcome of the presidential election at the expense of the lives of poor Nigerians, but he chose to tow the path of selflessness. 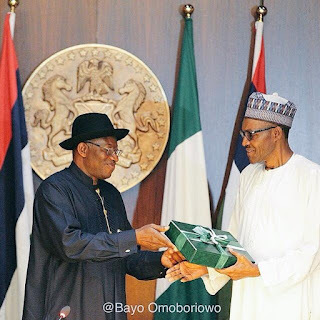 The president-elect spoke when he received the hand-over notes from Jonathan at the Presidential Villa. Buhari said: "Until I read and digest these notes from the president, I don’t think I will be in a position to make any strong contribution. 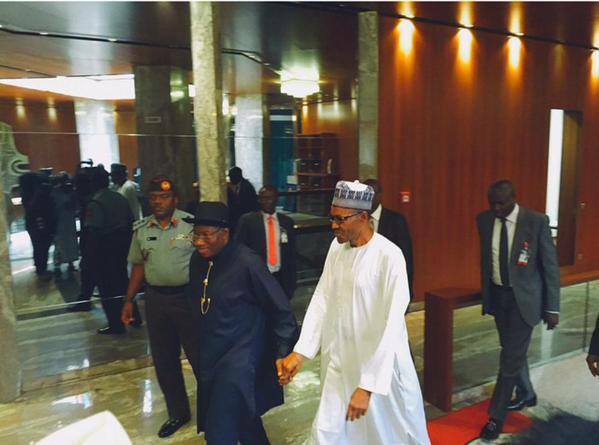 "But what I will say is since the telephone call you made you have changed the course of Nigeria’s political history. For that you have earned yourself a place in our history, for stabilising this system of multi party democracy system and you have earned the respect of not only Nigerians but world leaders. "All the leaders that spoke to me and congratulated us for arriving at the point we arrived, mentioned this and I could understand, a lot of relief in their voices that Nigeria has made it after all and this is largely owed to a situation. "If you (Jonathan) had attempted to make things difficult, you could have made things difficult and that would have been at the expense of lives of poor Nigerians, but you choose the part of honour and may God help all of us. Thank you very much your excellency." Before handing over the notes as well as the report of the national conference to Buhari, Jonathan said "this will give you (Buhari) a mission statement of the commitment of this government for the past five years and the directions we are going that will help you to navigate. "So is my pleasure on behalf of the vice president, members of the executive council and other senior functionaries to formally hand over these hand over notes to Gen. Muhammadu Buhari, the president-elect who will assume office tomorrow congratulations. "There is another document that I will hand over to you, to me this is more important than the hand over notes. The hand over notes is the activities of an administration, it shows where we started, where we are going, in some of the cases you'll follow, in other cases you may take other angle. "But this is a document that was compiled by Nigerians, the report of the National conference 2014. We gathered almost 500 Nigerians from other works of life, they were not influenced by government in any way. "And most of the recommendations here, if it is followed most of the gray areas even in our politics will be smoothen out. Most of the areas where people complain bitterly corruption, everything this document deal‎s with them. Some people here were members of that great body of about 500 egg heads. "We were unable to implement because of the shortness of time, we have sent a copy to the National Assembly but is a document that we are very hopeful that your government will look into it and give it the attention it requires. "It also my pleasure on behalf of the vice president, members of the executive council and other senior functionaries and especially the conference members that developed this report, the baby of the nation, to hand over this also to you."